Mixed Salad Annie: A Yard Sale with A Sweet Side! If you have been wondering why I haven't been posting a lot lately, it's because I've been busy making baked goods for a yard sale/bake sale. My friends and I have been planing to have a huge yard sale for a month. 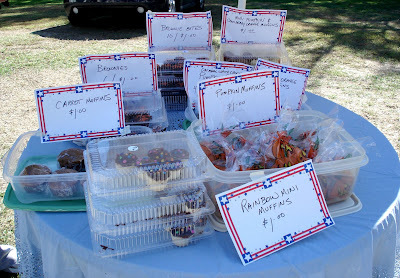 Since I love to bake, I decided to add a bake sale to the mix! This weekends cool crisp air was perfect for all the fall favorites: Pumpkin muffins, Carrot muffins, Cranberry and Orange Muffins. Of course I had to make the all time favorites like brownies and funfetti mini cupcakes. It was a lot of fun. I decorated the brownies with frosting and halloween sprinkles. The muffins were in pumpkin decorated bags and the mini muffins in halloween decorated zip lock bags. So Cute! I got the plastic containers from my local grocery store's bake shop. Some people didn't even know that the stuff was homemade because it was packaged so professionally! I love it!! Maybe you should start your own bakery? Emilie, Yeah it's been suggested and I've thought about it... but if it was a job I don't think I would like doing it anymore. I think you should start a bakery. All of you're baked goodies look absolutely delicious!